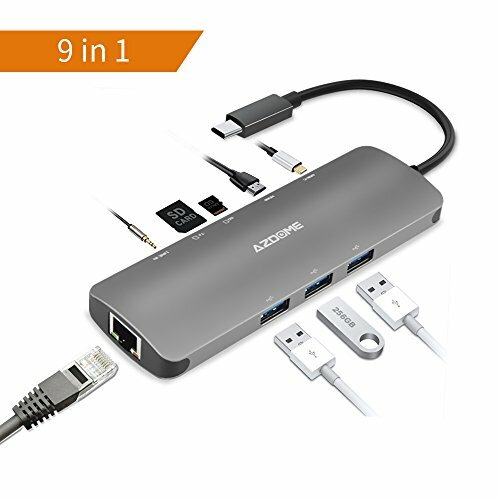 [9 IN 1 GREAT EXPANSION ] 3 x USB 3.0 Port, 2 x USB 3.0 TF/SD Card Slot, 1 x HDMI 4K@30Hz, 1 x RJ45 1000M Ethernet port, 1 x USB C power delivery PD 2.0 Port, 1x 3.5mm line-in Port. Allow you to quickly upload and download photos, videos, music and other files. Connect to your external storage, keyboard, mouse, headset, optical drive. [4K HDMI VIDEO OUTPUT] Mirror or extend your screen with HDMI port and directly stream Max 4K 3840×2160@30Hz, Full HD 1080P@60Hz to external HDTV display. Share your idea and do your presentation through extra projectors, view photos and watch movies on you TV(supports 4K). [POWER DELIVERY PD 60W(20V/3A)] Simultaneously transferring data and charging for Macbook 2015/Macbook 2016, Macbook Pro 13''/15'' 2016, Google Pixel Chrome-book 2016. NOTE:NOT compatible with devices based on QC (Quick Charge2.0/3.0) charging protocol. [iMac-STYLE COMPACT & SLIM] The USB C adapter dock has ultra slim design (12*4.3*1.5 cm) and 2.5D Unibody Aluminum Alloy case, it helps dissipate heat better and faster. Portable and saves desktop space, great news for neat man. If you have any questions about this product by AZDOME, contact us by completing and submitting the form below. If you are looking for a specif part number, please include it with your message.